As you can see, the approaching third season premiere of Game of Thrones is not going unnoticed or ignored by Entertainment Weekly. The magazine is putting the HBO fantasy-drama series front and center for its latest issue, with two of the drama's best characters featured on the cover, which urges us to be prepared for "the most thrilling season yet." And for those of us who think we're ready for what's in store, EW uses some of Ygritte's words when saying, "You know nothing about Season 3." 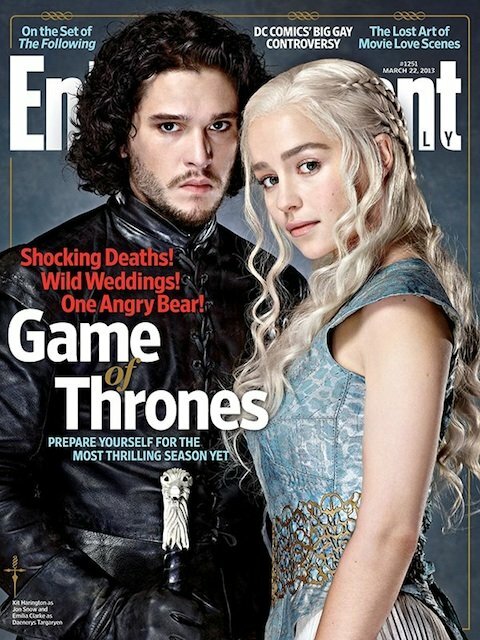 Just the sight of Jon Snow and Daenerys looking gorgeous and determined should be enough to evoke excitement and anticipation for Season 3, which according to EW's cover, includes "Shocking deaths, wild weddings and one angry bear!" Those who have read George R.R. Martin's A Storm of Swords from the Song of Ice and Fire series are likely to be a lot more prepared for what's ahead than the rest of us. Showrunners David Benioff and Dan Weiss discussed (without spoiling anything) some devastating scene that left the crew very emotional. We keep hearing vague references to big things ahead. Big things. And the above comments only add to that. Game of Thrones is not a series to pull its punches. With a throne on the line, wars, dragons, backstabbing and family rivalry, any character's episode can be their last and as we learned in Season 1, no one is off limits when it comes to casualties. EW's GoT issue hits stands this Friday (March 15). Game of Thrones Season 3 returns March 31 at 9:00 p.m. on HBO. Watch the extended trailer here.